As one of the last films I may ever review for this website, we find ourselves at a dramatic milestone for Berkeley Squares. We entered our very first preview event up at Cineworld in Hengrove Avenue, a cinema I had never been to before. Accompanying me was breakthrough film reviewing star William Palmer. Having never visited this cinema before, we quickly took to inspecting it to make sure it had all of the hallmarks of a big cinema, one to rival Vue and Cinema de Lux. Worry not, locals of BS14, for we found similarly dodgy toilets, overpriced popcorn, and disrespectful audience members. With William having cut his hair in such a way that it was hard to distinguish between him and Ellen DeGeneres, we feared lest we were not taken seriously. But we always are. Finally, we sat down to watch the film, greeted by a lovely message from the stars and director telling us to tweet what we thought about the film after watching it. At last, the film started, with introductory narration from Simon himself as played by Nick Robinson. Nick gives a rather subtle performance, a touch I thought was very fitting in a film otherwise filled with high school stereotypes. The smartest element of this film is the contrast between these stereotypes and more grounded scenes with Simon trying to hide the fact that he is gay. A real credit must go to both the actors and writers for this choice. While supporting characters around Simon (Leah, Abby, and Nick) are given nothing particularly difficult to do, nor anything particularly different from other high school films, the actors certainly do a good job at portraying them. Their humour as a group – as well as the humour throughout the film – always lands, giving the film an innocent charm that is to be found in the best of high school films. The character Martin (Logan Miller) is incredibly well-written, for the fact that he is meant to be an inherently cringeworthy character. What makes him so difficult to watch is the reason why he is so good; while he is over the top, he still has elements that many will recognise in people that they know. If you don’t recognise them, that probably means that you were like him at some point. The film moves forward at a quick pace, centred around the main story of Simon trying to find “Blue” – the alias of someone who goes to his school who is also struggling with his secret homosexuality – who he strikes up a conversation with online. The scenes focussed on these moments are quite touching, especially when Blue is so afraid to reveal himself to Simon. It really does highlight that this is a film telling a story that has so far not had the amplification of a major studio: amplification that is well overdue. This has to be one of my favourite high school dramas due to how it handles the subject matter from both a narrative and film-making perspective. Although there is one moment where the plot dictates the characters instead of the characters dictating the plot, it manages to use the regular clichés of this genre to great effect and to make certain scenes of Simon and Blue’s communication all the more effective. 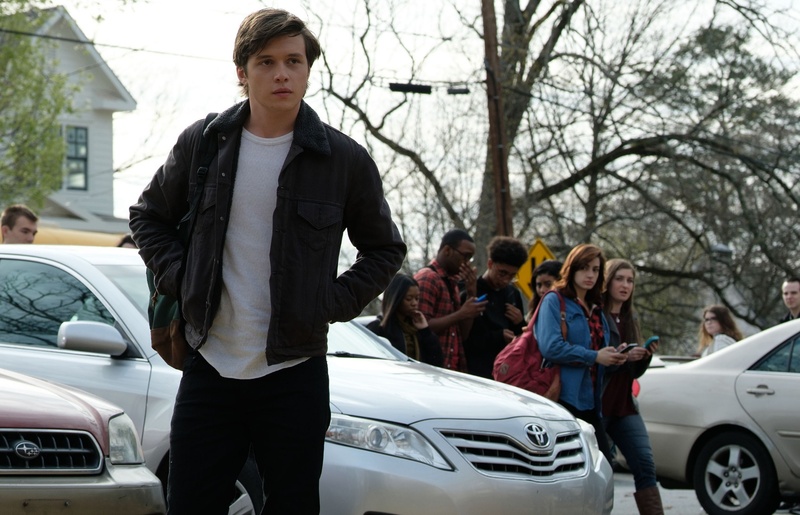 “Despite being about as far from gritty as they come, ‘Love, Simon’ has just enough charm, wit, and self-awareness to melt even my rather cynical heart. Nick Robinson plays Simon’s coming out scenes, in particular, with chilling authenticity: perfectly capturing the crippling fear and awkwardness of revealing something so intimate even in an overwhelmingly supportive environment. This is a film anyone can enjoy, but it will also bring great strength to those coming to terms with their sexuality, and the internet is full of stories of people using it to start conversations. Indeed, Robinson’s own brother came out as gay around the time that filming started. Chris makes a fantastic point that I had not considered. While I can sit here and talk about how the film is excellent in its own right, it will be remembered more for its context. Well written, well acted, a great message and a fantastic feel-good film.